Water Jet Cutting - G & W Machinery Sales, Inc.
A water jet cutter, also known as a water jet or waterjet, is an industrial tool capable of cutting a wide variety of materials using a very high-pressure jet of water, or a mixture of water and an abrasive substance. The term abrasivejet refers specifically to the use of a mixture of water and abrasive to cut hard materials such as metal or granite, while the terms pure waterjet and water-only cutting refer to waterjet cutting without the use of added abrasives, often used for softer materials such as food or rubber. Waterjet cutting is often used during fabrication of machine parts. It is the preferred method when the materials being cut are sensitive to the high temperatures generated by other methods. Waterjet cutting is used in various industries including mining and aerospace for cutting, shaping, and reaming. 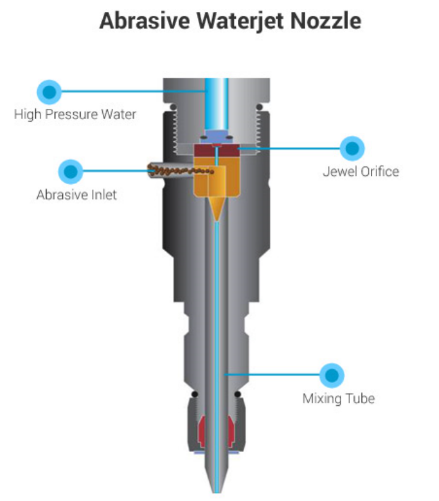 While using high-pressure water for erosion dates back as far as the mid-1800s with hydraulic mining, it was not until the 1930s that narrow jets of water started to appear as an industrial cutting device. In 1933, the Paper Patents Company in Wisconsin developed a paper metering, cutting, and reeling machine that used a diagonally moving waterjet nozzle to cut a horizontally moving sheet of continuous paper. These early applications were at a low pressure and restricted to soft materials like paper. Waterjet technology evolved in the post-war era as researchers around the world searched for new methods of efficient cutting systems. In 1956, Carl Johnson of Durox International in Luxembourg developed a method for cutting plastic shapes using a thin stream high-pressure waterjet, but those materials, like paper, were soft materials. In 1958, Billie Schwacha of North American Aviation developed a system using ultra high pressure liquid cutting to cut hard materials. This system used a 100,000 psi (690 MPa) pump to deliver a hypersonic liquid jet that could cut high strength alloys such as PH15-7-MO stainless steel. Used as a honeycomb laminate on the Mach 3 XB-70, this cutting method resulted in delaminating at high speed, requiring changes to the manufacturing process. While not effective for the XB-70 project, the concept was valid and further research continued to evolve waterjet cutting. In 1962, Philip Rice of Union Carbide explored using a pulsing waterjet at up to 50,000 psi (345 MPa) to cut metals, stone, and other materials. Research by S.J. Leach and G.L. Walker in the mid-1960s expanded on traditional coal waterjet cutting to determine ideal nozzle shape for high-pressure waterjet cutting of stone, and Norman Franz in the late 1960s focused on waterjet cutting of soft materials by dissolving long chain polymers in the water to improve the cohesiveness of the jet stream. In the early 1970s, the desire to improve the durability of the waterjet nozzle led Ray Chadwick, Michael Kurko, and Joseph Corrivaeu of the Bendix Corporation to come up with the idea of using corundum crystal to form a waterjet orifice, while Norman Franz expanded on this and created a waterjet nozzle with an orifice as small as 0.002 inches (0.05 mm) that operated at pressures up to 70,000 psi (483 MPa). John Olsen, along with George Hurlburt and Louis Kapcsandy at Flow Research (later Flow Industries), further improved the commercial potential of the waterjet by showing that treating the water beforehand could increase the operational life of the nozzle. High-pressure vessels and pumps became affordable and reliable with the advent of steam power. By the mid-1800s, steam locomotives were common, and the first efficient steam-driven fire engine was operational. By the turn of the century, high-pressure reliability improved, with locomotive research leading to a sixfold increase in boiler pressure, some reaching 1600 psi (11 MPa). Most high-pressure pumps at this time, though, operated around 500–800 psi (3–6 MPa). High-pressure systems were further shaped by the aviation, automotive, and oil industries. Aircraft manufacturers such as Boeing developed seals for hydraulically boosted control systems in the 1940s, while automotive designers followed similar research for hydraulic suspension systems. Higher pressures in hydraulic systems in the oil industry also led to the development of advanced seals and packing to prevent leaks. These advances in seal technology, plus the rise of plastics in the post-war years, led to the development of the first reliable high-pressure pump. The invention of Marlex by Robert Banks and John Paul Hogan of the Phillips Petroleum company required a catalyst to be injected into the polyethylene. McCartney Manufacturing Company in Baxter Springs, Kansas, began manufacturing these high-pressure pumps in 1960 for the polyethylene industry. Flow Industries in Kent, Washington set the groundwork for commercial viability of waterjets with John Olsen’s development of the high-pressure fluid intensifier in 1973, a design that was further refined in 1976. Flow Industries then combined the high-pressure pump research with their waterjet nozzle research and brought waterjet cutting into the manufacturing world. 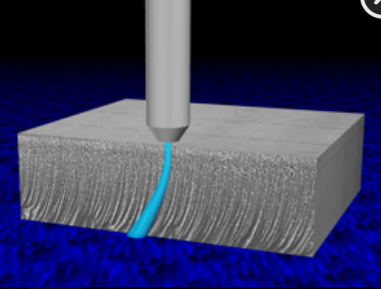 While cutting with water is possible, the addition of an abrasive turned the waterjet into a modern machining tool. This began in 1935 when the idea of adding an abrasive to the water stream was developed by Elmo Smith for the field of liquid ablative blasting. Smith’s design was further refined by Leslie Tirrell of the Hydroblast Corporation in 1937, resulting in a nozzle design that created a cohesive mix of high-pressure water and abrasive. Smith and Tirrell’s nozzle design set the groundwork for an efficient abrasive waterjet cutting tool. Producing a commercially viable abrasive waterjet nozzle came next, and an engineering research team at Flow Industries built on their high-pressure pump research, as well as Tirrell’s original nozzle design from the 1930s and Schwacha’s research in high-pressure waterjet cutting from the 1950s, to develop the modern abrasive waterjet nozzle. The final step was creating a durable mixing tube that could withstand the power of the high-pressure abrasivejet, and it was Boride Products (now Kennametal) development of their ROCTEC line of ceramic tungsten carbide composite tubes that significantly increased the operational life of the abrasivejet nozzle. As waterjet cutting moved into traditional manufacturing shops, controlling the cutter reliably and accurately was essential. Early waterjet cutting systems adapted traditional systems such as mechanical pantographs and CNC systems based on John Parsons’ 1952 NC milling machine and running G-code. Challenges inherent to waterjet technology revealed the inadequacies of traditional G-Code, as accuracy depends on varying the speed of the nozzle as it approaches corners and details. Creating motion control systems to incorporate those variables became a major innovation for leading waterjet manufacturers in the early 1990s. 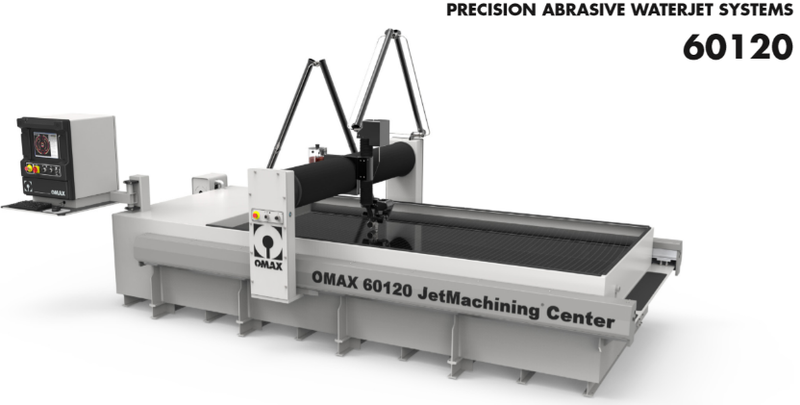 Upon establishing OMAX Corporatin, they developed and combined a new motion control technology with proprietary software to create an accurate, affordable abrasive waterjet machine that was unlike anything else on the market. Today, these two innovators remain highly engaged in product development and work closely with company engineers to continuously introduce new technology for an ever-evolving industry.